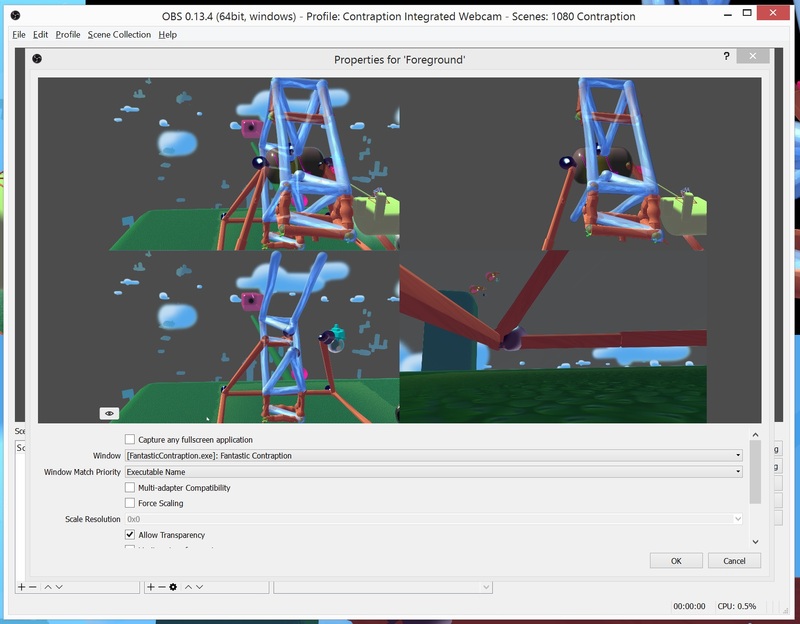 There are a couple of reasons you might not want to use the in-game webcam system (which is easier to set up). 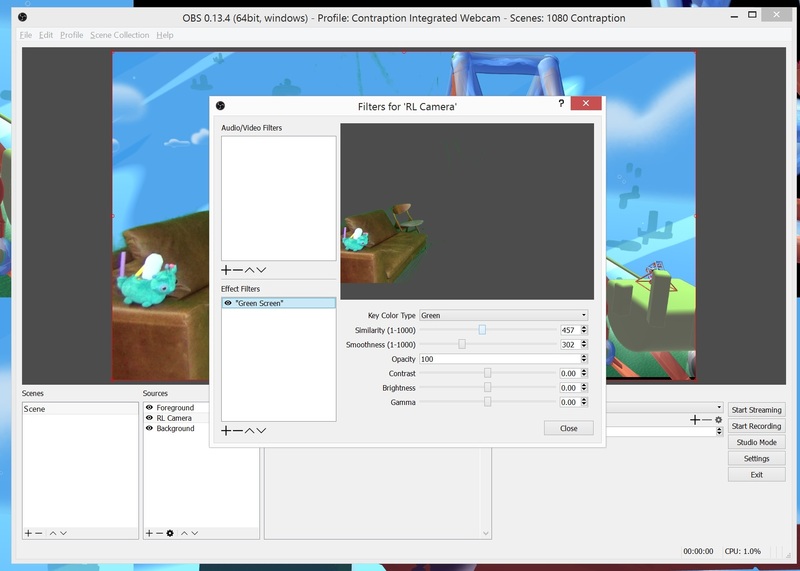 For technical reasons the in-game system only supports webcams so if you are using a camera with a capture card you can’t use it. This is unfortunate because webcams look terrible when the subject is more than a meter or two away from the camera. You might also be compositing the layers together after-the-fact in which case you will need to use this method to get the foreground/background split into two. 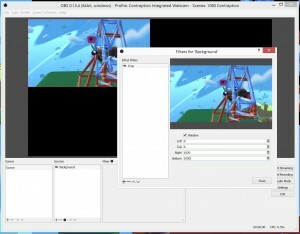 OBS (Open Broadcasting Software) is popular streaming software and is pleasently flexible. 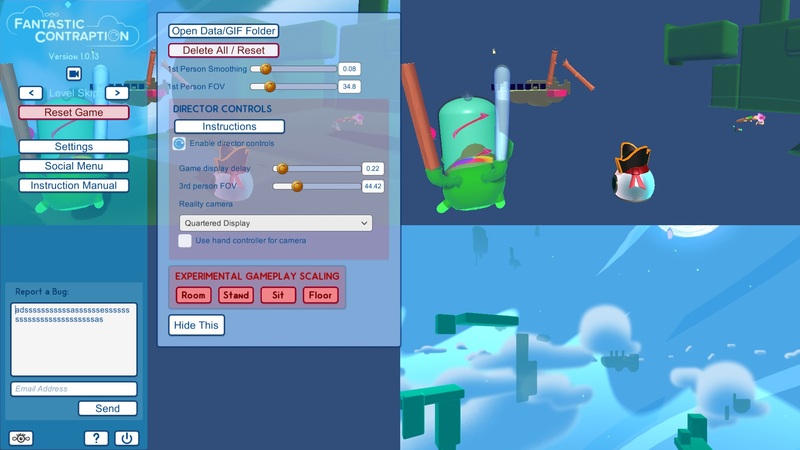 Weirdly OBS makes it kind of hard to export settings files so I’m going to walk you through setting it up for Fantastic Contraption. It’s good to know how this works anyway so you can make any changes you might decide you want to make. 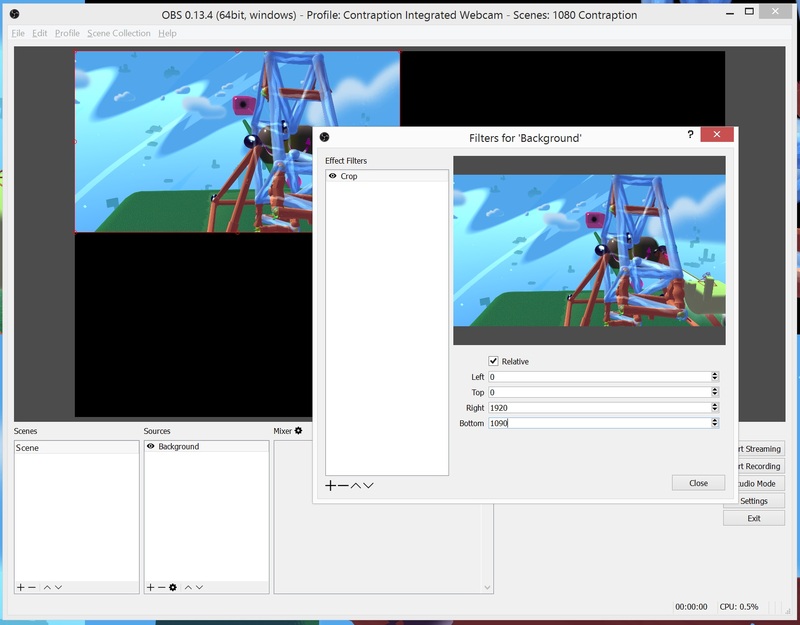 First download OBS if you don’t have it already (download the Studio version). Then open OBS. Note that since the game is broken into four quadrants your output resolution will be half of whatever your screen resolution is. I’m going to do this totorial with a 4k monitor which will let me stream at 1080 but you don’t need a 4k screen to stream the game. Just adjust the numbers to whatever resolution your monitor runs at. Select “Fantastic Contraption” in the “Window” dropdown. Give the game focus and use the wasd keys (as well as q & e for up & down) to fly the camera around. Use the arrow keys to change the angle the camera looks. This will be much easier with another person to help you. 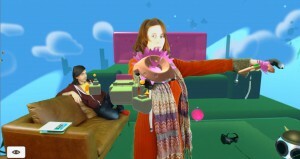 To get a rough idea of where the camera should be have the other person go into VR. They will see an insect with a big eye and wings, that’s your camera. 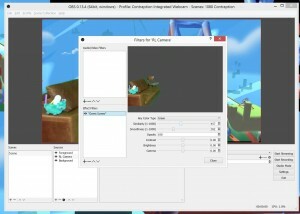 Have them direct you, move the in-game camera to where the real-world camera is. Then have them pick up the two controllers and walk to the back of the play area. Get them to hold out their arms in a T-pose and then not move. 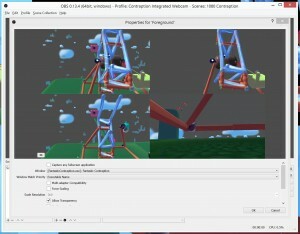 Using the arrow keys change the angle of the camera until the controllers are as close to matching the real-world controllers as possible. Note that the FOV is still off so you won’t get a good match. Drag the “3rd person FOV” slider until the in-game controllers are the same distance apart as your friends (very tired) arms. Now go back to the previous instructions to learn the Director Controls. Under step “3. Camera Sync” you say “Make sure the game and OBS are both open and the game has the Depth Cameras turned on” but I can’t find a ‘depth camera’ toggle/switch/setting. Where can I find that?